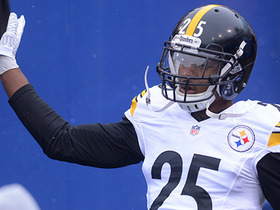 Analysis: The 2013 second-rounder appeared in just five games for the Steelers this season, en route to recording three catches for 21 yards. Hunter is eligible for free agency this offseason, at which point he'll either look to re-sign with Pittsburgh or look for a depth wideout job elsewhere. Analysis: Hunter should've had a touchdown on a blown coverage in the second quarter, but he instead hurt his shoulder while diving for a badly overthrown pass. With rookie James Washington placed on the inactive list, Darrius Heyward-Bey will step in as Pittsburgh's No. 4 wide receiver for the rest of the night. Analysis: Hunter will be a healthy scratch Sunday while James Washington fills in at wide receiver behind Antonio Brown, JuJu Smith-Schuster and Ryan Switzer. Hunter caught two of his four targets for 15 yards during Sunday's 33-18 win over Cleveland. Analysis: Hunter how has just three catches for 21 yards in four games this season, with all three receptions coming against Cleveland. The Steelers don't face the Browns again this season, and fantasy owners don't need to roster Hunter either. Hunter (coach's decision) is inactive for Sunday's game against the Chiefs, Dale Lolley of DKPittsburghSports.com reports. Analysis: The Steelers' decision to make Hunter a healthy inactive comes as a surprise after he played 51 of a total 84 offensive snaps in the team's Week 1 tie with the Browns, finishing with one reception for six yards on five targets. Hunter's unimpressive showing appears to have cost him the No. 3 wideout job, with rookie second-round pick James Washington ready to assume those duties in the home opener. 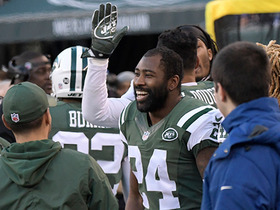 Hunter caught one pass (five targets) for six yards in Sunday's 21-21 tie against the Browns. Analysis: Hunter saw significant playing time, with just 12 fewer snaps and three fewer targets than JuJu Smith-Schuster. However, that's where the comparison ends, as Smith-Schuster's 119 yards led all Pittsburgh receivers. Hunter is expected to be a part of three-wide sets Sunday at Cleveland, Jeremy Fowler of ESPN.com reports. Analysis: Since he was selected in the second round of the 2013 draft, Hunter has bounced around four organizations in five seasons, never surpassing 30 catches, 500 yards or four touchdowns in a given year. Behind Antonio Brown and JuJu Smith-Schuster, Hunter also has to contend with rookie James Washington, but the veteran showed well in the preseason with a 7-132-1 line. Hunter caught two of three targets for 37 yards and a touchdown during Saturday's preseason game against the Titans. Analysis: Starting alongside JuJu Smith-Schuster and second-round draft pick James Washington, Hunter caught a deep pass from Ben Roethlisberger for a 32-yard touchdown bomb to give Pittsburgh an early 7-0 lead. 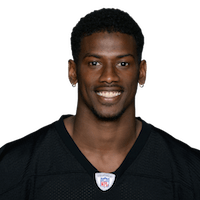 Antonio Brown (quad) sat this one out, and may see little-to-no action in the final preseason game, giving Hunter another opportunity to showcase his talents as he competes with Washington (abdomen) for the third wide receiver position. 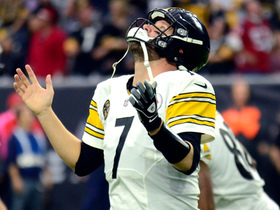 Hunter signed a one-year contract with Pittsburgh on Thursday, Teresa Varley of the Steelers' official site reports. Analysis: Hunter has bounced around a bit since being drafted by the Steelers in 2013 but ended up back with the team in 2017, recording just four receptions for 23 yards and one touchdown in seven games. He'll likely be a back of the depth chart option at receiver in 2018. Hunter is scheduled to visit with the Cowboys this week, Clarence Hill of The Fort Worth Star-Telegram reports. Analysis: A 2013 second-round pick, Hunter has played for three teams the past three seasons, unable to establish himself as anything more than an occasional deep/red-zone threat. 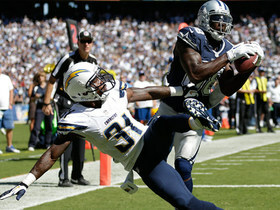 He could make sense as a replacement for fellow free agent Brice Butler, who averaged 18.5 yards on 43 catches in his 36 games for Dallas the past three seasons. The Cowboys also are looking at Dontrelle Inman as an option to solidify their depth behind Dez Bryant, Terrance Williams and Cole Beasley. Hunter caught his only target for five yards and a touchdown in Monday's 34-6 win at Houston. Analysis: The catch was only his fourth this season, and his first since Week 8, although it resulted in his first touchdown since joining the Steelers. Even with Antonio Brown (calf) likely to miss the Week 17 game against the winless Browns, Hunter is not a viable fantasy option. Pittsburgh Steelers quarterback Ben Roethlisberger connects with wide receiver Justin Hunter for a 5-yard touchdown. 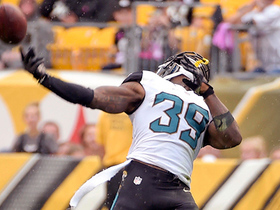 Jacksonville Jaguars defensive back Tashaun Gipson comes down with the fourth interception of the game against Ben Roethlisberger, who tried to test the Jaguars deep. 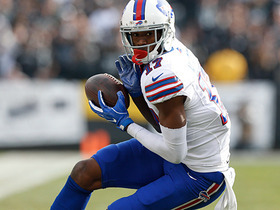 Pittsburgh Steelers cornerback Artie Burns picks off Buffalo Bills quarterback Tyrod Taylor. 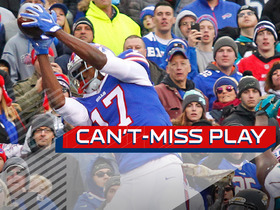 Buffalo Bills wide receiver Justin Hunter pulls in the juggling catch for 22 yards on a pass from QB Tyrod Taylor. 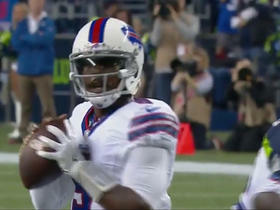 Buffalo Bills QB Tyrod Taylor finds wide receiver Justin Hunter for a 16-yard TD. 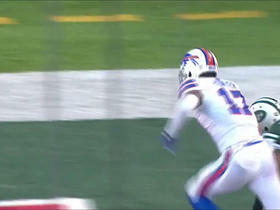 Buffalo Bills QB Tyrod Taylor finds wide receiver Justin Hunter for the 5-yard TD. 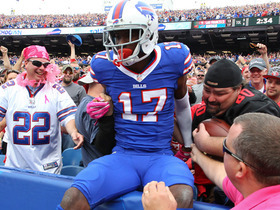 Buffalo Bills quarterback Tyrod Taylor finds wide receiver Justin Hunter for a 30-yard touchdown.